Pressure Canning Winter Squash - Butternut Soup Base - Canning Homemade! The flavors of winter squash are some of my favorite and during the winter season I can't wait to bake up a batch of butternut. One of my new goals for this year is trying new recipes using the ingredients that I put up in jars. Butternut soup is one of those recipes that I will be working on, but wanted to get the soup base ready for the season. I was very excited to work on this recipe and it came to me this morning in my email. Margaret sent me an email for the Butternut soup base that basically was the squash with spices and for the liquid using a vegetable, chicken or beef stock or broth. I headed to the farmers market in search of butternut squash. I was talking with one of the local farmers and he said that was early in the season for butternut but the prices would drop later in the winter as they crop became more plentiful. It was good information to know, but I was set to get the soup done now! I checked with the USDA Home Canning book and I decided not to add the spices to the squash but used chicken stock for flavor. Here is the recipe for the Butternut Soup Base. My cubes aren't perfect but not bad for a first attempt. I will make the soup in the next week or so as the weather gets cooler. This recipe makes 7 quarts. Procedure: Peel (I used a veggie peeler), cut lengthwise, remove seeds, cut into 1-inch wide slices. Then cut flesh into 1-inch cubes. Boil 2 minutes in water. Caution: Do not mash or puree. Fill hot jars with cubes and then add chicken stock, leaving 1-inch headspace. Remove air bubbles and adjust headspace if needed. Wipe rims of jars with a dampened clean paper towel. Adjust lids and put into pressure canner. 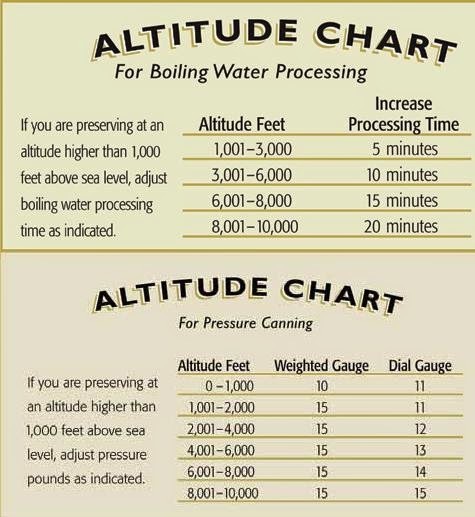 Process at 11lbs of pressure for 90 minutes for dial gauge canner and 10lbs for weighted gauge canner. Note: If you are planning on doing the recipe in pints you will process in the pressure canner for 55 minutes. In a large pot open up to 3 quarts of the jarred butternut including liquid. Using an immersion blender or potato masher blend till the desired consistency. If the soup is thick add up to 1/2 cup of chicken broth to thin or up to 1/3 cup heavy cream for a twist. Add salt and pepper to taste. Bring to a boil, reduce heat and simmer about 15 minutes. 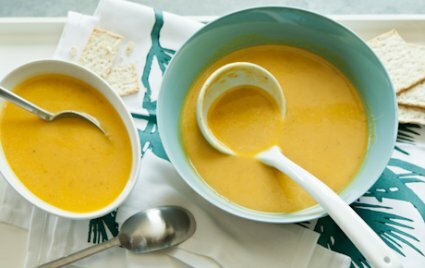 There are three varieties of the basic soup that you can add a "twist" to enhance the soup flavor. Stir in grated nutmeg, about 1/4 t. per quart into puréed soup. Additionally add 2 tablespoons of unsalted butter and stir. Garnish each serving with fresh grated nutmeg. Stir in up to a tablespoon of red curry paste and 2 teaspoons chopped fresh ginger. Add 1/2 cup coconut milk. Purée soup and garnish each serving with toasted coconut flakes and chopped fresh cilantro. Add up to a tablespoon chopped chipotles in adobo sauce. Garnish soup with crumbled queso fresco, toasted pumpkin seeds and chopped fresh cilantro.